Alfred James has been researching and writing about cricket for more than forty years. He is not a man who covets sales figures, his subject choices being some way outside the mainstream. 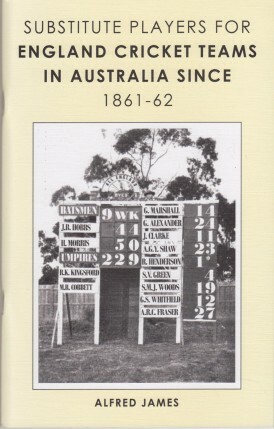 In my collection I have a substantial book on the 1880 Australian tour of England, and a more modest one on an Australian tour of Malaysia in the 1920s. To further demonstrate the sort of man he is James is also responsible for the definitive work on Sir Donald Bradman’s appearances in minor cricket, most definitely one from the labour of love category. Two entries particularly caught my eye, the first in relation to the famous Bodyline tour of 1932/33. In a three day match against Northern New South Wales, sandwiched between the fourth and fifth Tests, the MCC side lacked Douglas Jardine, Walter Hammond, Herbert Sutcliffe, Eddie Paynter, Les Ames, Harold Larwood, Gubby Allen and Hedley Verity. That meant two substitutes were required, and according to James the locals were deeply aggrieved at this. One of the men they got to see was the side’s manager and former England captain ‘Plum’ Warner. Maybe not the biggest draw but the other ringer was, for his last ever appearance in Australia, the Master himself, Jack Hobbs – and the Aussies call us whingers! As for the second I am not generally one to nit-pick when an author makes a mistake, still less when it is patently obviously accidental, but James does make one that brought a smile to my face. I was taken back to my last days at primary school when I fell into precisely the same trap myself. Unusually my teacher was male, and a man I did like, but he struck me as a strange one nonetheless. As a sport mad youngster I couldn’t understand his antipathy for the two games I loved, football and cricket. The time eventually came when I had an opportunity, so I thought, to make my point. My class were tasked with writing an essay about our favourite author. The brief was wide-ranging, and it was stressed we did not have to choose a writer of fiction. I needed no second invitation and selected Neville Cardus as my subject. I worked tremendously hard on that piece of work, knowing my teacher would hate the content, but determined to give him no cause for complaint about the quality of the writing. I waxed lyrical about my fondness for Cardus’ style, and his priceless ability to create in my mind’s eye a picture of a Victorian cricket field with a winning Lancashire side on it. At one point I mentioned in passing, or at least intended to, the name of the county’s England ‘keeper of the 1880s, Richard Pilling. I knew I’d written a good ‘un when I handed my work in, and looked forward to the praise I confidently expected. A week later our marked efforts were returned to us. In time honoured fashion our names were read out one by one, and as we went to retrieve the battered blue exercise books a few words of praise or criticism were uttered. Mr Tyldesley, and you don’t get a name more redolent of Lancashire and Lancastrians, left my name until last. I knew that was a good sign, and my chest was bursting with pride as I finally walked up to collect my exercise book. “Very well written young Martin, and very interesting too”, he said with a smile as he handed it over. As I began to turn to go back to my desk he added “Just one mistake though”, and the colour rose in my cheeks as he demonstrated he couldn’t have been quite as ignorant as I thought “……… it was Richard and not Harry Pilling who used to keep wicket”. And then just to rub my nose in it “Do you think ‘Little ‘Arry’ will ever get to play for England?” A great favourite of mine he never did of course, and sadly died a couple of years ago. James has made exactly the same mistake, so we are both in good company, and the name of the small man of county cricket lives on – all is well. This interesting little book appears in a print run of just sixty copies. What is described as a trade edition of fifty is certainly not cheap, and the beautifully bound limited edition of ten, signed by the author and Fraser is a price that is difficult to justify for a book that can comfortably be read from cover to cover in fifteen minutes, but for those who are so inclined it is a splendid addition to a collection. Whether copies remain available I know not, but the usual suspects Roger Page and Mike Down have both had the book in stock, and then there is always the Publisher. Some books are timeless, and it is difficult to imagine that a time will come when the collection of biographical sketches that David reviews this week will seem dated.